Native of Marburg, born on 12th August 1647, the son of a reformist Lutheran minister. Between 1666 and 1669 he studied Law and Natural sciences in Marburg, subsequently becoming private tutor and teacher to a number of different aristocratic families in Hessen and Hamburg. Without formal academic qualifications and accreditation, from 1680 he began a career as a writer of historical fiction, publishing numerous formulaic works set in different countries of Europe & published by the Ulm publisher, Matthaeus Wagner. He was also author of a number of illustrated historical, geographical & scientific almanacs & compendiums. Perhaps the most important of these from a cartographic point of view was his Historia Moderna Europae, a recent history of political events in Europe over the previous 50 years, illustrated with numerous fine maps, portraits, views and engravings, an edition of which was published by Matthäus Wagner, posthumously in Ulm in 1692. About this time there appeared perhaps his most famous scientific- geographical work, Relationes Curiosae, which was originally published in individual parts between 1683 & 1691. The work included one of the first World maps to show the Ocean currents and live volcanoes, entitled Die Ebbe und Fluth auff einer Flachen Landt-karten fürgestelt. This is an important early representation of oceanographic phenomena. It illustrates Athansius Kircher's idea that there were chasms in the depths of the sea into which the water flowed & which then percolated through the earth and up to the tops of volcanic mountains.The map also appeared in editions of Happel's Mundus Mirabilis of 1687 & 1708. 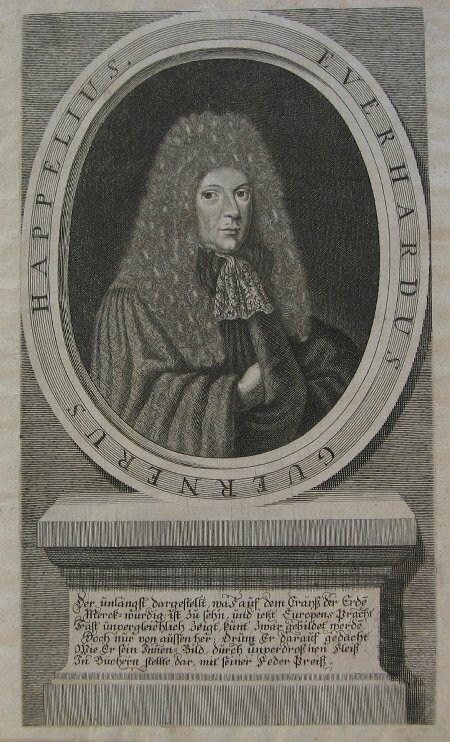 Happel himself died in Hamburg on 15th May 1690 & was survived by his wife Margerita and 4 children.